Stadium High School is a public high school in Tacoma, Washington, and a historic landmark. It is part of Tacoma Public Schools, or Tacoma School District No. 10 and is located in the Stadium District, near downtown Tacoma. The original building burned to a shell in 1898 while it was still a partially constructed hotel designed by Hewitt & Hewitt that was being used for storage. It was reconstructed for use as a school beginning in 1906 according to designs by Frederick Heath, and a "bowl" stadium was added later in 1910. The main building was constructed by architects Hewitt and Hewitt for the Northern Pacific Railroad Company and the Tacoma Land Company at what was then known as Blackwell Point. Construction began in 1891 with the intention of building a luxury hotel resembling a French château. The Panic of 1893, however, brought construction to an abrupt halt when the Northern Pacific was faced with financial disaster. The unfinished building became a storage facility, with much of the building materials still inside. On October 11, 1898, the building was gutted by a massive fire. The walls remained standing, and the Northern Pacific began to dismantle the structure, removing some 40,000 bricks that would be used to construct still-existing train stations in Missoula, Montana, and Wallace, Idaho. The Tacoma School District purchased the gutted building on February 19, 1904, with the intent of turning it into a high school. The redesign and later renovations were planned by the school's architect, Frederick Heath. It was repaired and renovated into a school. Despite its extraordinary locale and design, on the inside it looks, feels, and operates like a typical American high school. 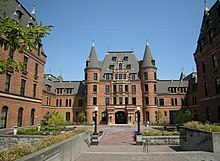 The reconstructed building opened on September 10, 1906, as Tacoma High School. Seven years later, the name was changed to reference the adjacent Stadium Bowl. Later additions included a circular lunchroom, an underground swimming pool, a science and industrial arts complex, a gymnasium, and a multi-story parking lot structure with tennis courts on the roof. The stadium, also designed by Frederick Heath, dates from 1910 and is in a location once known as Old Woman's Gulch. It was originally much grander than it is today, with a seating capacity of 32,000. Among those who spoke there were Theodore Roosevelt, Woodrow Wilson, Warren G. Harding, William Jennings Bryan, and Billy Sunday. The stadium was originally built in 1909–1910 using steam shovels and sluicing to move more than 180,000 cubic yards (140,000 m3) down the edges of the gulch to create a flat playing field of 2.5 acres (10,000 m2). Wooden molds were built to cast concrete for 31 rows of stadium seating surrounding the playfield. The original structure exceeded what the soil could support. A restoration project in the 1970s had to sacrifice roughly half of the seating capacity because of instability. In 1981 a burst storm drain washed away the scoreboard and the bayward end zone of the football field. This was followed by a further restoration allowing the stadium to reopen in 1985. The school was the filming location for many of the scenes of the 1999 movie 10 Things I Hate About You. In 2005-2006 the school underwent a major renovation, seismic upgrade, historical restoration, and expansion. Bassetti Architects were the design architects, and Merrit Pardini Architects (later Krei Architecture) were the architects of record for this work. During the renovation, students were temporarily relocated to the old site of Mount Tahoma High School in the south end, just over 7 miles (11 km) away. The centennial celebration of Stadium High School was held on September 16, 2006. The celebration was attended by 3299 alumni, setting a Guinness World Record for the largest recorded school reunion. ^ "Stadium". National Center for Education Statistics. Retrieved February 7, 2019. ^ "Metro Parks Tacoma". metroparkstacoma.org. Retrieved 4 August 2015. ^ a b Plaque outside the school, May 22, 1992. Consulted 16 August 2008. ^ "Stadium High School". Tacoma Schools. Archived from the original on 2014-01-05. Retrieved 4 August 2015. ^ a b c Plaque outside the stadium, May 28, 1993. Consulted 16 August 2008. ^ a b c d e f g h i j k "Some famous and notable graduates". The News Tribune (Tacoma, WA). September 9, 2006. ^ "The Spokesman-Review - Google News Archive Search". google.com. Retrieved 4 August 2015. ^ "Approve Starlet's Pact". The Kansas City Times. Missouri, Kansas City. Associated Press. June 18, 1952. p. 28. Retrieved January 18, 2017 – via Newspapers.com. ^ Eng, Lily (1996-12-19). "Former Captive's Life Troubled". Seattle Times. Retrieved 2009-06-08. ^ Sailor, Craig (2018-05-25). "China's American hero pilot honored at Stadium High Memorial Day ceremony". The News Tribune. Retrieved 2019-01-02. Wikimedia Commons has media related to Stadium High School. This page was last edited on 8 February 2019, at 00:48 (UTC).